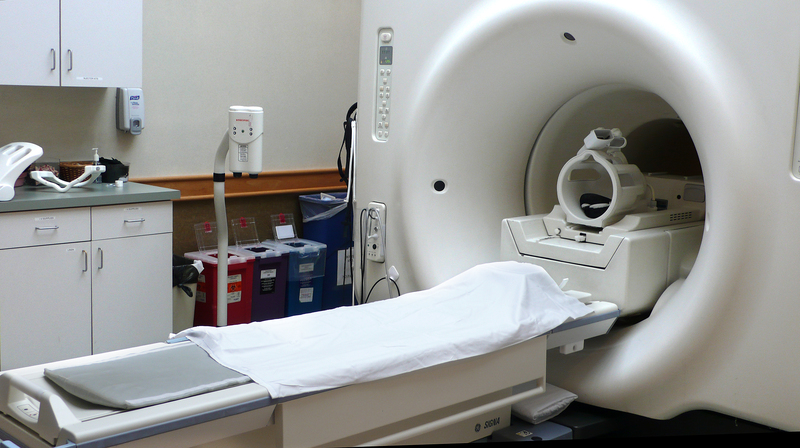 MRI is short for “magnetic resonance imaging.” The scanner itself if a large tube with a table in the middle. The patient will lay on the table and the table will slide the patient into the tunnel. MRI scans use a large magnet, radio waves and a computer to create a detailed image of a patients internal organs and structures. It can show unique information that other scans can not show, is painless and does not use radiation. MRI scans are used to examine the inside of the human body in a non-invasive way. MRI uses a strong magnetic field and radio waves to create detailed images of the organs and tissues within the body. The human body is largely composed of water. Water is made up of two atoms, hydrogen and oxygen. In those atoms is a proton, which is sensitive to any magnetic field. Electricity passing through gradient coils causes the coils to vibrate, which creates the magnetic field. MRIs use two magnets. The first magnet causes the body’s water molecules to align in one direction, as opposed to being randomly arranged. The second magnet is turned on and off in quick pulses. This causes the hydrogen atom to alter its alignment when the magnet is on. When the second magnet is off, the atom quickly return to its normal random state. The scanner detects the changes in the atoms and, along with the computer, creating an image of the body. How long do MRI’s take? MRI scans will last between 20 and 60 minutes depending on what part of the body is being analyzed. Also, if the first scan is not clear enough, the patient may have to undergo a second. While in the machine, people are given headphones or earplugs. This is meant to help drown out the sound created by the vibrating coils. No. It is important to stay as still as possible while in the MRI scanner. Movement while in the scanner can distort the picture, causing another scan to be needed. Scans are done in multiple parts, so either some or all of it would have to be repearted if a person moves. Some doctors may give a short break halfway though the scan if it is a long one. Sedation is also available for infants and young children. Most older children and adults do not require sedation. To get the best picture, the part of the patients body that is getting scanned has to be in the middle of the scanner. This causes some patients to worry about being confined in such a small space. There are shorter scanners available in some places, which are more comfortable if the patient is claustrophobic. Sedation is also an option, but the patient must have a ride home after the procedure. Seton Imaging is proud to offer a High Field Open MRI system at our Sheridan Drive location. A High Field Open MRI is specifically designed to provide a comfortable exam for claustrophobic patients without compromising on image quality. This open architecture helps to alleviate the claustrophobia that some patients may experience during conventional MRI scanning. This scanner is also designed to accommodate larger patients, with a table weight limit of 500 lbs. What does your technologist need to know before a MRI? Before a MRI scan, It is important to tell your technologist if you are allergic to any medications, are or might be pregnant or have any metal in your body. Metal includes heart and blood vessel devices, metal pins, or metal parts (including artificial limbs and dental work like braces), any other implanted medical device like a medicine infusion pump or a cochlear implant, and if you have cosmetic metal implants (piercings), or tattooed eyeliner. Also let your doctor know if you recently had surgery on a blood vessel, are claustrophobic, have any other health conditions (kidney problems, sickle cell anemia), have an intrauterine device, or if you wear any medicine patches. What happens before a MRI? Before an MRI scan, the patient will have to remove all metal and electronic devices from their clothing. This includes watches, jewelry, cell phones and credit cards. Depending on the part of the body being scanned, the patient may be required to put on a hospital gown. If you are having a study of your bile ducts, called an MRCP (magnetic resonance cholangiopancreatography), eating or drinking is not allowed for 2 to 3 hours before the scan. For other studies, refrain from eating or drinking beforehand if it is not necessary. For some scans, a dye may need to be injected into a vein through an IV. The dye is safe and is used to help the doctor see inside of the body. Are there any risks when having a MRI? MRI scans are very safe procedures. The magnetic field can not be felt unless the patient has certain types of metal in their body. In those cases, a MRI scan would not be able to be performed as the field can cause the metal to move, potentially causing injury. However, most people who have metal in their body can still have an MRI. Certain devices like pacemakers, implanted pumps, nerve simulators and brain aneurysm clips can become damaged if they go into the scanner. A patient who has one of those devices can not have an MRI Scan. There can also be allergic reactions to the dye that is injected into the body, but it is uncommon. Seton Imaging has been serving the Western New York community since 1984 as one of the areas longest-established Radiology practices. Our goal is to deliver superior imaging services. Our caring, knowledgeable staff is always dedicated to making your experience as pleasant as possible! Have a question about our procedures? We invite you to visit our Patient Information page to review some of our most frequently asked questions. You can always feel free to give us a call at (716) 633-8675 with any questions.